2017 Horoscopes have been prepared very meticulously by our Vedic expert on the basis of Moon Sign. Please click here to find out your Moon Sign. Leo 2018 horoscope is loaded with encouraging news! The year will welcome you with open arms and much revitalizing months ahead. You will feel that 2018 is better than 2017, which was full of mess and confusion. You will be relaxed and free from stress now. That said, in order to enjoy the relief, you will have to value the positive change and continue making steps towards growth by keeping your attitude and aggression under control. You will come out as a winner if facing problems due to enemies and rivals. In fact, lawsuit problems will sort out soon that too in your favor. That said, do not let this victory control your actions, be careful when it comes to competitors as they can hit you back anytime. Also, avoid overconfidence and tendency to pick up fights, as it can lead you into making more enemies. Get your fortune predictions for 2018. Detailed forecast on income, business, love, marriage and health. Business will be positive as your contacts might take charge to help you in bidding profitable proposals. This year brings some very important deals in your kitty, which will be long lasting. Frequent religious or business related travel is expected during the period from March to July 2018. In terms of love life, if you are single, expect wedding bells any time soon and if you are already married, this is the time to celebrate as promotion at work for spouse is indicated. Fiery Mars will be in exalted position from May to November 2018 and it will boost your chances of buying your dream home. Rahu, the dragon's head in your 12th house hints towards trips abroad this year. In fact, the 2018 horoscope is very positive if you were planning for settlement in a foreign country. With all things in place, you might have to give special attention to your health. You may have to face an old disease coming up to trouble you, that is why, a cautious approach is required. You must visit a doctor immediately after discovering any kinds of symptoms. On the other hand, financial condition and income prospects will see growth but with some delays. You may have some disputes with siblings but also, there is a possibility of handling them efficiently if you act maturely. January 2018 Horoscope suggests a positive period for vocational front. For jobholders, monetary advantages and improvements in work are expected. You may see an expansion of activities on the career front, which may yield productive outcomes. Envy among our coworkers may hamper the work environment. You should be cautious as progress may come at the cost of your health. Lawful issues may hurt your pocket. Thus, it is advised to avoid such undertakings during this period. For a superior growth of your profession, you may carefully maintain a strategic distance from any conflicts at work. Costs for improvement of wellbeing are likely. 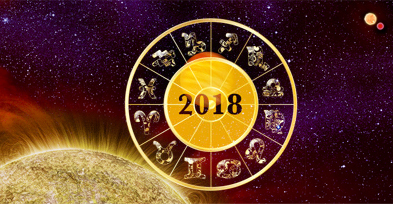 February Horoscope 2018 indicates a raise in adversaries for you. With a growth in your scope of abilities, associates may be forced to follow your steps. You should do well to maintain a strategic distance from tussles at work overflowing out of envy. Your business colleagues may pull in more benefits this month with their efforts. your spouse may display a variable demeanor with sudden emotional outbursts in this period. Added efforts on the work front may prove fruitful and may lead to opportunities of expansion. March Horoscope 2018 shows signs of progressions for your soul mate. Your better half may experience uncommon and remarkable growth. This might make him/her loaded proudly for a short period. Business voyages may end up being profitable. Work associates may transform into the wellsprings of fiscal advantages. Work may see signs of growth. Minor hiccups might be expected on the financial front. Savings should be carefully managed during this period. April 2018 Horoscope focuses on the beginning of a fortunate period ahead. You may encounter a flow of fortunes towards you. You may taste fruitful profits amid this period. A development of religious inclination might prompt you to take spiritual journeys or even on receiving new profound leanings. You may establish an improved persona during this period. Career should mostly be satisfactory. May 2018 Horoscope indicates a period of religion pull, significant learnings and otherworldly trips. Advancements in career are likely as luck should mostly be in your favor. You should stick with your current job as a surprise growth may soon mesmerize you. Domestic unbalance may cause worries while an ascent in societal position may push your self-esteem. Inheritance issues might become a matter of debate. June Horoscope 2018 is by all accounts a promising month with many financial advantages on the cards. Profession may see uncommon developments. New undertakings may rope in surprising profits. Favors from the govt. are likely while credit and affirmation at work would be there. Bounteous wealth, expanded wage and awesome compensation is illustrated. You ought to invest some energy for the betterment of residential environment. July 2018 Horoscope denotes a period of vigilance ahead. Odds of money related misfortune are signified. Financial stability may not be hampered however. Income may remain attractive however, it should be precisely monitored. Giving for philanthropy may end up being useful at a heartfelt level. Keep up a benevolent personality with associates. Nonetheless, evade any sort of overindulgence. August 2018 Horoscope signifies a spell that should draw out the brightest side of you. You may utilize your mind and learnings to precisely deal with your assets and maintain a strategic distance from any money related misfortunes. Your health may require your full focus. Minor illness may turn into a reason for expenditures. Social ventures may remain dull. Mostly, the month may remain passive. September 2018 Horoscope denotes a time for tolerance. Health troubles may prevail from the earlier days. Subsequently, your wellbeing and any lost riches might be recuperated however, only at a moderate pace. Economic wellbeing may enhance and you may spend for its betterment during this period. An enhanced wellbeing may enable you to work towards making more financial benefits. October 2018 Horoscope indicates a period when you may build up a serious and gutsy persona. Wealth seems to be ascending for you and also for your family, with your kin prone to taste acclaim amid this period. Overall advancement in life is denoted. Monetary status may rise during this period. You may spend towards obtaining fiscal resources. Profession should remain stable in general. Travel is additionally is not too far off. November 2018 Horoscope demonstrates a term of quality ahead. You might be more worried about an otherworldly development amid this period. Your initiative capabilities may expose you to new open doors at work and you may receive respect and acclaim among associates. You are furthermore inclined to develop incredible specialist qualities, which may cause clashes with associates. With control and power in your proprietorship, finding a place of authority is likely at work. December Horoscope 2018 shows a lively term for you. You may grow in your position of authority at work. A rising in reputation is on the horizon for you. Respect and regard at work are likely to follow. Accomplishment in new undertakings and ventures is also possible. Your network of acquaintances is likely to spread out in this month. Students looking for options for higher education may see open entryways from government foundations. Progeny might require watchful checking. Consequently, you should heed caution. When all is said and done, the month should bring a closure to the year with positive vitality and prospering. also known as summer time, is a conventional local time adopted by many countries of the world on a seasonal basis. Most commonly DST is obtained by adjusting the official local time forward, by one hour, for the spring, summer, and early autumn periods. You need to specify birth time as per clock time at the time of birth and whatever DST adjustment was applicable (if any) that time in your city of birth. Ask about your 2018 Fortunes!